To sustain the strong presence in the future, the art of creating a win-win situation will be a key factor! SMEs are crucial to economic strength. Every country prefers a protectionist approach toward SME interests, which is natural. But amid the changing environment, there is a need to develop a formula which helps us to deal with the future challenges and I believe SME collaboration would be a right step! India, Japan and U.S. are the largest, trusted and oldest democracies of the world. Together these three countries represent 25 percent of the world’s population and 35 percent of the global GDP. The strategic partnership between India, Japan and U.S. is crucial to maintaining peace, stability and balance. India, Japan and U.S. have shared strong democratic values and a culture that supports openness, transparency and the rule of law. To strengthen this trilateral partnership India is playing a crucial role. Prime Minister Mr. Narendra Modi’s leadership approach is ‘sabka sath, sabka vikas’, Collective Efforts, Inclusive Growth. Mr. Modi has refreshed the spirit of global cooperation and collaboration among the world community. His Neighborhood first policy has sparked the optimism among the South Asian nations… just one month after taking charge as Prime Minister of India, Mr. Narendra Modi asked ISRO to develop a SAARC satellite which can be dedicated as a ‘gift’ to the neighbors, ISRO is prepared to launch this satellite by the end of this month…. Japan has an inclusive outlook to development too. Prime Minister Mr. Shinzo Abe’s Free and Open Indo-Pacific Strategy is vital to improve the connectivity between Asia and Africa and for the growth of the region! India and Japan have a history of close and friendly relations. Their strong relationship and combined capacities can help the world to deal with the challenges of radicalism, extremism and terrorism. SME collaboration – SMEs are the backbone of the economy. SMEs are crucial for job creation and economic growth of a country. In emerging economies, the contribution of formal SMEs is up to 45 percent of the total employment and up to 33 percent of the national income. These numbers are significantly higher when informal SMEs are included. Indian SME sector is vibrant. SMEs contribute 45% to country’s GDP. SME sector employs close to 46 crore people, and it is growing at 11.5% annually. The Indian government has adopted a cluster based development approach as a key strategy for enhancing the productivity and competitiveness as well as capacity building of SME/MSMEs. During the last two and a half years, the Indian government has taken a number of initiatives to boost this sector like EODB reforms, Pradhan Mantri Mudra Yojana, Public Procurement Policy, Make in India, Startup India, Standup India and Skill India etc. In the Unites States SMEs makeup 99% of all firms and generate 65 percent of net new private sector jobs. SMEs represent 98 percent of all U.S. exporters and 34 percent of U.S. export revenue. The small businesses of U.S. are highly optimistic about their growth under Trump administration. According to the National Small Business Association of United States’ survey, 54% of small businesses expect economic expansion in the next one year. Now if we look at Japan, their SMEs contribute approx 99.7% of all companies, 70% of all employees and 55.3 percent of the GDP. SMEs are the hidden strength of Japanese giants organizations as a majority of the products of large corporations consist of components from SMEs sub-contractors. SME sector in Japan is known for its service industry, retail trade and construction industry. India, U.S. and Japan’s current leadership approach is growth oriented…there is an optimistic environment among the Small businesses of these three countries. Our exchanges are going well; we respect each other’s unique advantages. This is the right time to scaling our collaborations to the next level. 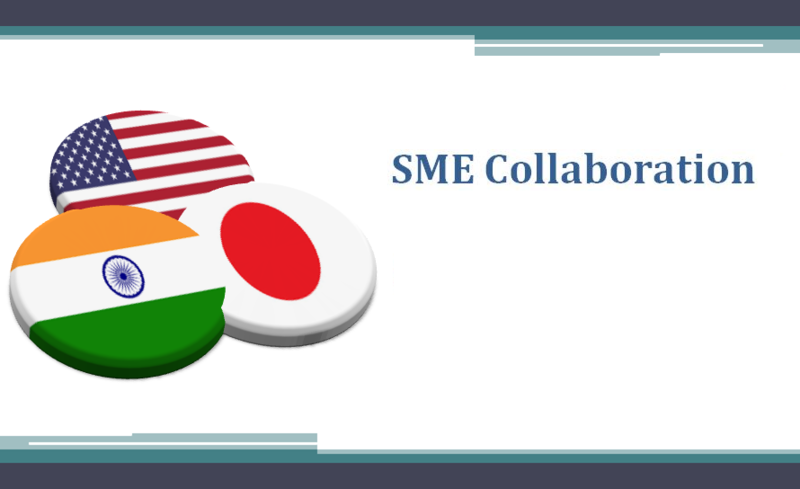 In India, U.S. and Japan’s trilateral partnership a collaborative and integrated approach is needed to provide a right platform to SMEs. There is a need to develop a technology-based platform and governance structure that provides the opportunities to SMEs of these three countries to collaborate and to explore the untapped sectors and opportunities, this platform should act as an enabler for SMEs. To refresh and boost this trilateral partnership it is necessary that India, Japan and U.S. endorse each other’s strategic needs and territorial integrity. Apart from defense cooperation, technology transfers and people-to-people interactions there is need to form new platforms of business cooperation too.